More and more often I meet with the opinion that democracy has exhausted its capacity to select wise leaders. It’s funny, because the same charges have accompanied democracy from its birth. Aristophanes took advantage of the freedom ensured for him by the Athenian democracy in order to ridicule it. In The Knights a character of a sausage seller, Agoracritus, appears and Demosthenes tells him that he has all the qualifications for a politician – his education is meager, he is impudent, he lacks refinement, but the only obstacle may be the fact that he can read a bit. Aristophanes was convinced that the rule of the people was not only ridiculous but dangerous because it leads to unreasonable decisions. After the fall of ancient Greece the idea of a democratic state sank into oblivion and attempts to revive it were met with resolute resistance. The renaissance of democracy came first with the Enlightenment. People had revolted many times, sometimes they even managed to overthrow the ruler, but this still didn’t mean the rule of the people. Later the cruelty of the French Revolution didn’t encourage such ideas. The American experience, however, was quite new, partly because there was no entrenched social structure in the New World, no aristocracy, no gentry, no bourgeoisie, no peasants, and no mechanisms ensuring that everybody knew his place. Democracy in Europe came in by the backdoor, by the servants’ entrance, and to this day it cannot shake off the culture of contempt. However, in the end it attained its civil rights, and now to deny them is so much not the done thing that every tyrant pretends to be a democrat; he organizes elections and assures everyone that he is following the constitution. 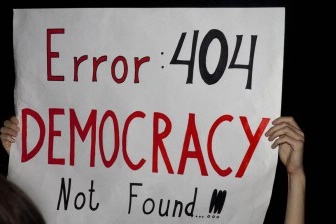 Democracy itself has failed many times. We could mock the appearances of communist democracy in the USRR or China because we were sure that it was a premeditated fraud. Russian intellectuals promised the peasants that the workers would have it better and, calling for the overthrow of Czarism, decided to overthrow capitalism too while they were at it. They promised democracy, people power, and electrification. Czarism, while trying to discourage the people of this idea, called for pogroms, persuading everyone that all these ideas were Jewish ideas. It appealed to the eternal tradition of directing accumulated frustrations onto a scapegoat that people would be allowed to murder with impunity. It was an effective strategy, but not effective enough because the revolution won and the aristocracy was replaced by the avant-garde of the proletariat, while landowners were replaced by the directors of collective farms. Those who are against democracy like to quote the example of Hitler gaining power – an election victory of one of the greatest demagogues in history, who managed to rouse the electorate by appealing to national pride and paranoid fears. His anti-Semitic insanity turned out to be more effective than the one used by Czarism to defend itself from Communism. This was also socialism, but a national variety, one which was aimed at the guilty party, who was close by - in a shop on the next street - who was easy to catch and who had no ability to defend himself. The aversion to this guilty party was deeply embedded; it was present in the consciousness and subconsciousness because his guilt was known to mothers and grandmothers and all ancestors since time immemorial. They betrayed Jesus, they betrayed Muhammad (which was less important in a Munich beer cellar), they kidnapped Christian children and killed them for matzos, they wounded the Host, they poisoned wells, they turned peasants into drunkards, they went in for usury, they invented Communism - and the long queues were all their fault. They were useful for every occasion and for everybody, but most of all, for those who wanted to organize a terror machine. Many have puzzled over the question of why so few protested, why the striking absurdity of this anti-Semitic madness attracted millions, both the mob and the middle class, both intellectuals and office workers. This scarecrow managed to be beggarly and mighty, repulsive and horrifying, weak and evoking disdain as well as giving rise to fear. Just this mixture made anti-Semitism an ideal instrument for a demagogue and allowed for a genuinely democratic way to power. Democracy relies on rationalism. It is a system that assumes that people are capable of independent thinking and that they value their freedom highly, and finally, that they are not suicidal. We’ve heard a lot about the flight from freedom, and we’ve always listened to it with some disbelief and with a deep conviction that such an illness could only afflict somebody else. The phenomenon of the flight from freedom is always accompanied by calls for collective thinking. That is an oxymoron, but the phenomenon itself gives a warm sense of togetherness and a surety that I can’t be wrong. Collective thinking loves collective madness; it feeds on a need for hatred and murder. Here anti-Semitism is irreplaceable. The temptation of collective thinking lies in wait for everybody. There is a constant demand for ideas that transform our small communities into multimillion masses living by one thought. A demand appears for a commander and not for a leader who directs a discussion. Those who increasingly want to believe in something often believe in anything at all. The suppliers of information stop checking the quality of goods they supply to the market because there is a demand for everything. Astonished and horrified by what’s happening with our democracy, I have a feeling that we lose sight of what’s happening in places which used to be unattainable models for us. When we can no longer control reality, a need for magical thinking emerges, a need for an all-purpose enemy who is guilty of everything. For Hitler Jews as a race were just such an enemy. This idea was picked up by the leaders of Muslim communities, who were deeply convinced that Israel’s existence was a barrier that blocked their chances for development and that Jews scattered throughout the world were an overwhelming force that were mobilizing the rest of the world against the one true faith. (They were well prepared for such an idea by their whole religious tradition.) A few people openly reject the authority of such leaders, millions live in fear of those who try to unite everybody around one leader, still others are prepared to die for their caliph. Democracies no longer want to be policemen and are doggedly searching for moderate fanatics, looking askance - and more and more with hostility - at moderate believers. Faraway fronts are no longer far away and the madmen now have much more than just ancient rifles. We want to believe that they are not suicidal, that there is a possibility to come to an agreement, that they are rational after all, and that’s why we are looking for moderate fanatics rather than for moderate believers; we are ready to justify and even share their sick obsession. We have no problem with sharing this obsession - after all, this is also our tradition (a bit compromised by Hitler), so we need new words. Every day we get astounding examples of the pervasiveness of this madness. In one month the British Labour Party suspended more than 20 members for anti-Semitism (more than 30 had already been suspended earlier). Among them are such bigwigs as Ken Livingstone, the former mayor of London who arrived at the novel conclusion that Hitler was a Zionist (i.e. he contributed to the establishment of this horrible Israel). A few days ago a Labour activist from London was suspended for presenting “the history of Jewish genocide against the British”. He revealed that Jews had financed Cromwell, caused the decapitation of Charles I because he wanted to deprive them of control of the state’s finances, and Neville Chamberlain, Winston Churchill and Tony Blair were all Jewish puppets. Musabbir Ali added that Israel was behind ISIS and the recent bombings in Ankara. We could just shrug our shoulders at the sight of such mental aberration if we were not witnessing the recurrence of the disease that we saw not so long ago. Mass insanity marches on a broad front. Absurd media messages which people believe without the least blink of an eye. Israelis are committing genocide, Israelis cut out Palestinians’ organs and sell them on the international market, Israelis kill children and shoot defenseless and absolutely innocent people.Israelis are not Jews but rather Khazars who impersonate Jews, they are colonialists who have replaced earlier colonial powers, and they constantly foment war. Both the man in the street and politicians believe these astonishing stories. Political Islam has taken over the role of a demented Nazi system - it spurs its own societies to fight, convincing them that the West hates Islam and Muslims. Many people in the West have trouble distinguishing between the idea of Islamofascism and the Muslims, just as previous generations had trouble distinguishing between Nazism and the Germans. The threat of another cataclysm - a feeling of being lost, a feeling that we were dreaming about a better world and that we cannot manage our problems - forces us to look for a Messiah to tell us what to do. There are many candidates, but we are choosing the ones who are saying comprehensible things, things we’ve heard before, things which sound familiar and do not give rise to skepticism. We are marking the seventieth anniversary of the Nuremberg Trials. Can we understand yet why Europe allowed the swallowing of Czechoslovakia without one word in protest, why even now we think that World War II started with the attack on Poland, why America waited for the Japanese, looking unconcernedly on the massacres in Europe, why the anti-Semitic madness of Nazism was not only treated with seriousness but even evoked favorable interest in Europe and across the ocean? These were the questions of my youth; today I’m astonished by the repetition - by the inability to discern the disease or to know what the sick are capable of. In the face of a threat to democracy we stop believing in democracy; in the face of threats of another Shoah we mobilize sympathy for gangsters and layers of hatred towards those in danger. Can we imagine a leftist columnist, an atheist, writing an article entitled “God bless the IDF”? As margin note to the commemoration of the Nuremberg Trials, Fred Maroun, a Canadian born and raised in Lebanon, writes about the threat of annihilation of the Jewish state and the extermination of its inhabitants. He writes about monsters who are once again promoting the dehumanization of the Jews in the name of world conquest. The difference between the thirties of the last century and today is the existence of the State of Israel and the Israeli Army, writes Maroun. The continuation of Nazi plans started in 1948, the second attempt was tried in 1967 and another one in 1973. This time an Israeli soldier was standing on the railway track to Auschwitz, repelling repeated attacks. Don’t be surprised, writes Maroun, that the IDF is the main object of hatred of anti-Semites - Arabic, European and American - from the left and from the right. But the IDF of today is just as moral as the IDF of 50 years ago. The difference is that while in the past the IDF’s main attackers were regular armies, today the IDF is attacked by cowards who use children as their main weapon and who use the media’s naivety and cynicism as their main tool. The IDF of today is just as important to the Jewish people as the IDF of 50 years ago. The anti-Semitic hate has not abetted. In fact, it keeps increasing. The haters know that while Western governments appease them and international bodies are their pawns, the IDF is still there, as tough as ever, standing up for the Jewish nation. It is perhaps an odd phrase for an atheist to say, and it may be an even odder phrase for an Arab to say, but every moral person of every ethnicity and every religious persuasion should say it with me: God bless the IDF. Why? Fred Maroun has explained it many times: it’s impossible to separate the fight for democracy from the fight against fascism. He adds here his leftist convictions about equality and respect for the right of minorities. He adds also rationalism, constantly threatened by madness. A rebellious Egyptian journalist tries to explain to the Egyptian public that it has let itself be hijacked by Islamist Fascist propaganda, that it has started to believe the absurd claim that the West hates Islam. The West, which builds mosques, takes in refugees from the war-torn Islamic world, and elects a Muslim as a mayor of London. I’ve posted his video on YouTube and it has had several dozen viewers. Another video, entitled “What Israeli soldiers are doing to Palestinian children” has had (in its Polish version) over one million two hundred thousand viewers, and every day a few hundred more new enthusiasts for ammunition to revive the old hatred. At my age I shouldn’t be surprised by anything anymore. The flight from freedom has as a companion the need for collective thinking. I’m posting here this short video with the statements by Ibrahim Issa. A few more people will watch it, people who are also surprised and are searching for explanations, who are asking what’s happening with America, which is now facing a choice between Trump and Clinton, what’s happening with Poland, what’s happening with Britain. I do not try to predict the future. I’m just an observer, and day after day I can see the persistent search for moderate fanatics and the persistent rejection of moderate believers.